Candy Overload Flourless Peanut Butter Cookies – easy peanut butter cookies with no flour or butter! 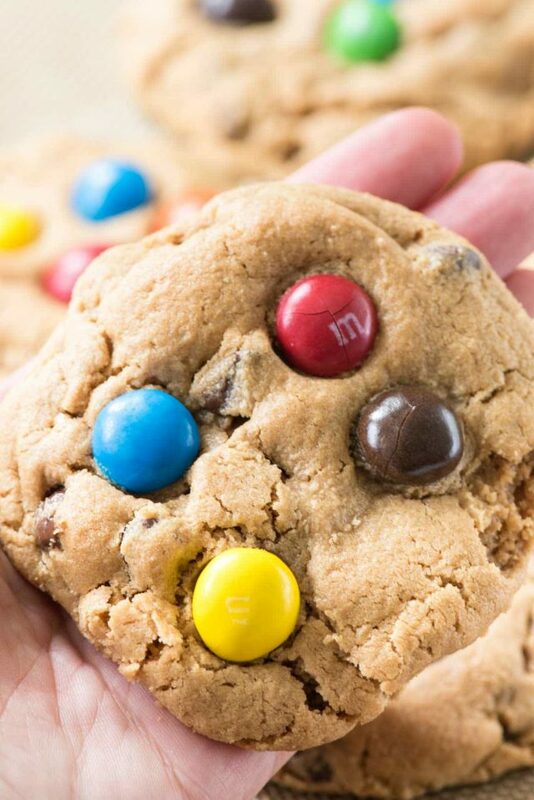 It’s the best peanut butter cookie recipe that’s accidentally gluten-free, and they’re stuffed with peanut butter cups and M&Ms too! Yesterday I was working in the kitchen all day, creating recipes, shooting videos, and taking photos. I got through two full videos and photo shoots and was starting to clean up when I realized how quiet it was in the house. Like, eerily silent. Remembering the times when toddler Jordan would suddenly go quiet, I got curious and went looking for Abby (our puppy). I walked into the living room and discovered she had found a sheet of paper in a reusable grocery bag and ripped it apart…all over the living room and dining room. Shards of paper were everywhere. I just laughed and shook my head and left the room, hoping that it would disappear before I returned. Having a puppy is definitely an adventure, that’s for sure. She’s eaten my bath rugs, all of the white stoppers off the back of the doors, and last night she got ahold of a food coloring bottle Jordan left out and died her face and feet red. Right now she’s chewing on my chair as I hurry and try and type this. I think it’s her way of saying get on with it woman! If you’ve started stocking up on Halloween candy, or maybe you have some candy leftover from Easter or Valentine’s Day (not that I’d know about that…) then these easy Candy Overload Flourless Peanut Butter Cookies are for you. Wow, that’s a mouthful of a title. Okay, so let’s break down this easy cookie recipe. Have you ever made flourless peanut butter cookies? They’re one of my favorite recipes to make because they’re SO EASY and so good. If you’ve ever had a peanut butter cookie and felt a bit underwhelmed then these are the cookies for you. 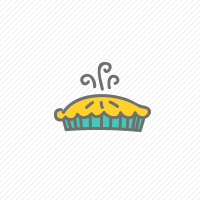 Because the recipe has just 3 main ingredients: sugar, egg, and peanut butter, you really taste the peanut butter flavor. To take this flourless peanut butter cookie to the candy overload side, I started by adding chocolate chips to the batter. That in itself is delicious, but then I went and stuffed them with peanut butter cups. Did you hear me? 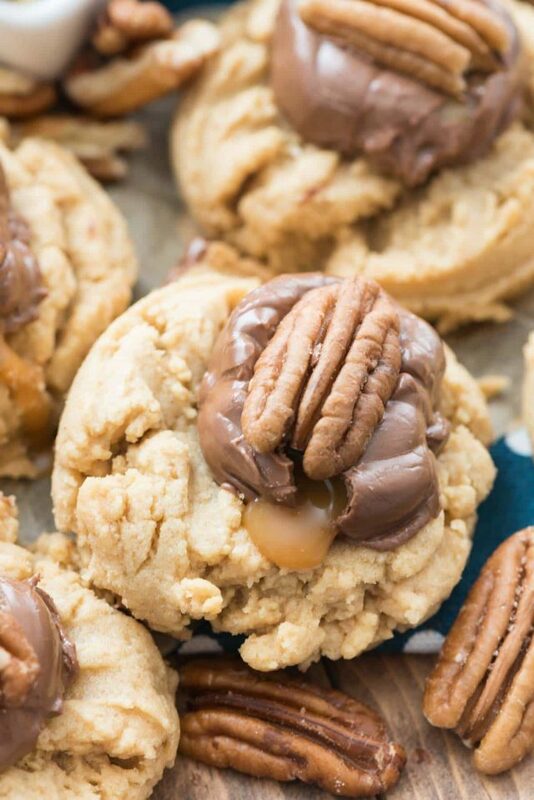 Cookies STUFFED WITH PEANUT BUTTER CUPS are what your dreams are made of. Don’t use natural peanut butter that you have to stir. I use Skippy or Jiff Naturals usually, but that’s a no-stir product. Use something commercial for best results. Don’t have brown sugar? You can use all white. Add you favorite candy inside – it doesn’t have to be a peanut butter cup or M&Ms. Any kind of chocolate chips or candy will do. Try Rolos or Snickers or anything you love. I love using the peanut butter M&Ms on top but plain or peanut would work too. Be careful when removing these from the cookie sheet. Because there is no flour they’re more crumbly and a little less stable than a normal cookie recipe. Candy Overload Flourless Peanut Butter Cookies - easy peanut butter cookies with no flour or butter! 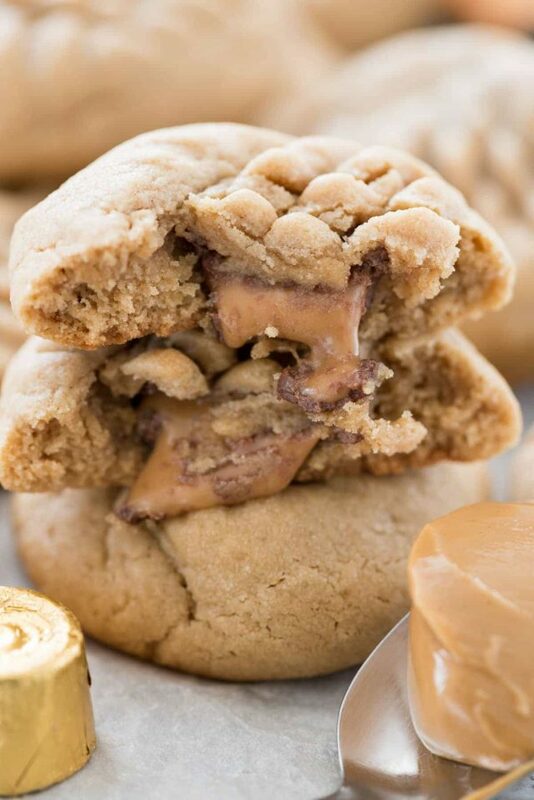 It's the best peanut butter cookie recipe and they're stuffed with peanut butter cups. Preheat oven to 350°F. Line 2 cookie sheets with parchment papers or silicone baking mats. Stir together peanut butter, both sugars, and egg. Stir in chocolate chips. Scoop cookie dough in desired size (I used a large ice cream scoop that's about 1/4 cup). Place a peanut butter cup in the center and roll to cover completely. Place on prepared cookie sheet and top with 4-6 peanut butter M&Ms. Bake for 10-15 minutes, or until they are just no longer glossy. Cool completely before removing from cookie sheet. If you love peanut butter cookies as much as I do, be sure to check out Flourless Peanut Butter Cookies with Sea Salt by A Family Feast, Peanut Butter Walnut Brownie Cookies by It’s Yummi, or even Flourless Blender Muffins by Crunchy Creamy Sweet! 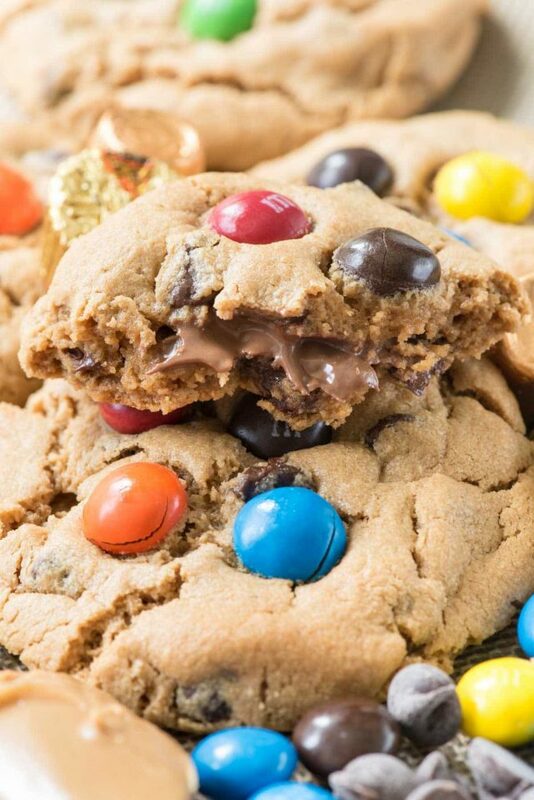 The perfect cookie post Halloween when there is way.too.much.candy laying around! 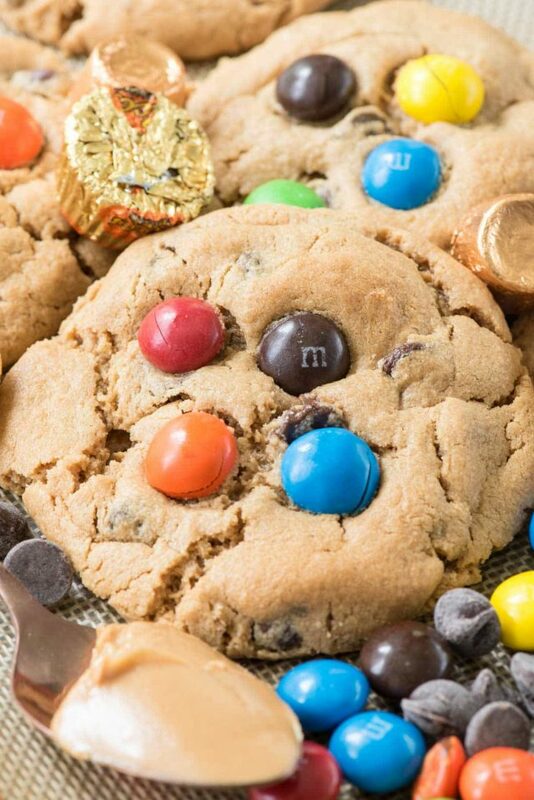 hey girl- these cookies look amazing! I think these cookies were made for ME! Can’t wait to try them! Yum!!! 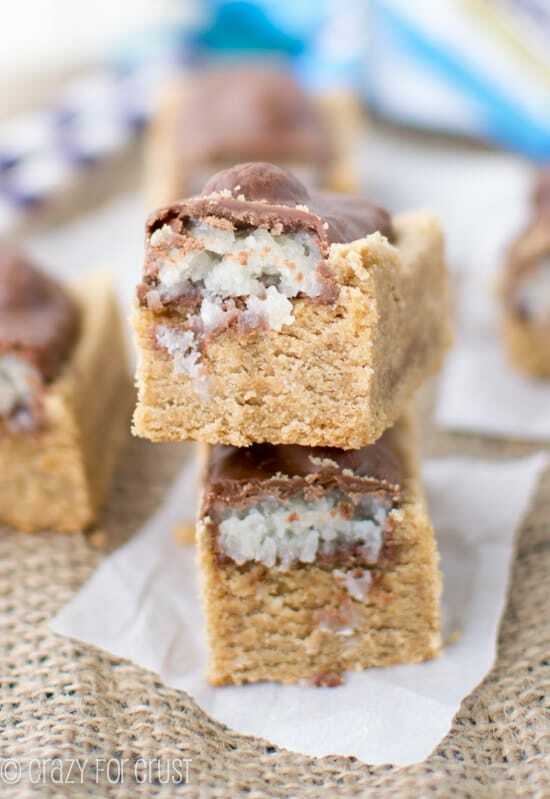 Making these right now, but I think I’ll do peanut butter chips instead of chocolate! Thx!